One of the wineries we were really looking forward to visit during our research for the upcoming Vinologue Priorat guide was Portal del Priorat. It took some time to meet up with owner Alfredo Arribas, though, as he was constantly at various events throughout Europe. Given the awesome label designs and extremely positive reviews we had seen for his Gotes, Negre de Negres, Somni, and Tros de Clos, it’s not a surprise that the man was in high demand. It turns out that the wait was worth it as his wines are excellent and while not cheap, they are well priced for the style of wine that they represent. While we had seen the Montsant wines and were aware of them, during this tasted an unknown surprise popped up: the Siuralta. 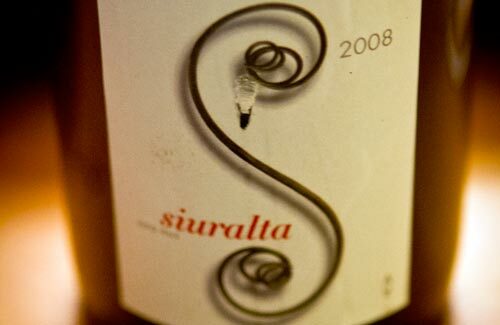 This wine is from vineyards at an elevation of 750m that are at least 60 years old and growing on chalk soil near the small, stunning, cliff dwelling village of Siurana, thus the Siurana+Alta name (alta means high.) It’s part of an upcoming “Vins Nus” or “naked wines” project which, as the bottle showed has a goal of really showcasing the fruit, locale, and truly wonderful nature of these grapes. We can assure all of our grape-loving readers that this has most definitely been accomplished, although Alfredo stated this is the beginning of his experiments and he wants to push it further with future vintages. We await with glasses at the ready.